Feb. 1, 2019—Falls Church, VA — Ronald L. Perl, partner-in-charge of Hill Wallack’s community associations and eminent domain practice groups in Princeton, N.J.,has been awarded the Don Buck Lifetime Contribution Award, the most prestigious honor given by the College of Community Association Lawyers (CCAL). 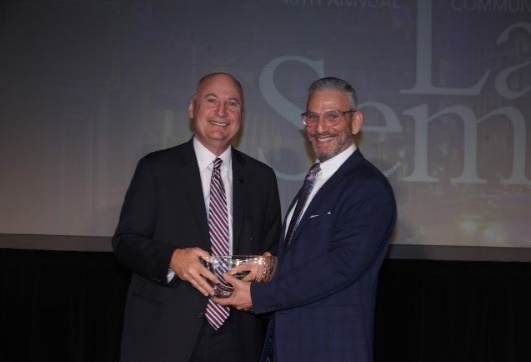 Perl accepted the award on Jan. 25 during the 2019 Community Association Law Seminar in New Orleans. Through this award, CCAL ensures that Buck's spirit, devotion, and commitment to the community association industry remain alive. The Don Buck Lifetime Contribution Award is awarded periodically at the discretion of the CCAL Board of Governors. Perl is the eighth recipient of the award. Established in 1993 by the Community Associations Institute (CAI), the College of Community Association Lawyers (CCAL) provides a forum for experienced legal professionals working in the community association field to exchange information. Its goals include promoting high standards of professional and ethical responsibility, improving and advancing community association law and practice, and facilitating the development of educational materials and programming pertaining to legal issues. Members are lawyers who have demonstrated skill, experience, and high standards of professional and ethical conduct and are dedicated to excellence in the specialized practice of community association law. They are involved in state and federal legislative activities and prepare amicus curiae (friend-of-the-court) briefs on critical judicial cases that affect common-interest communities. CCAL provides advanced professional educational programs to its fellows and provides solutions to community association legal challenges. It is a collegial forum for the exchange and development of ideas by some of the most knowledgeable attorneys in the field. Since 1973, Community Associations Institute (CAI) has been the leading provider of resources and information for homeowners, volunteer board leaders, professional managers, and business professionals in 346,000 homeowners associations, condominiums, and housing cooperatives in the United States and millions of communities worldwide. With more than 40,000 members, CAI works in partnership with 36 legislative action committees and 64 affiliated chapters within the U.S., Canada, South Africa, and the United Arab Emirates as well as with housing leaders in several other countries, including Australia, Spain, Saudi Arabia, and the United Kingdom. A global nonprofit 501(c)(6) organization, CAI is the foremost authority in community association management, governance, education, and advocacy. Our mission is to inspire professionalism, effective leadership, and responsible citizenship—ideals reflected in community associations that are preferred places to call home. Visit us at www.caionline.org and follow us on Twitter and Facebook @caisocial.